We are delighted to announce that Stories for Homes Volume 2 is now in preparation. We plan to launch the e-book in September 2017 and a paperback version in November 2017. Just as with Stories for Homes 1, all profits will go directly to Shelter. We received an amazing 256 submissions for the new anthology. The standard of submissions was incredibly high and the selection process tough. After much deliberation, 55 pieces have been selected for inclusion in the anthology. We would like to take the opportunity to thank everyone who submitted for their generosity in offering to donate their work for this very important cause. With so many quality submissions, it was inevitable that some excellent writing wouldn’t make it into the anthology. We are delighted to announce that we will be publishing a further 29 stories on this website in the months leading up to the publication of the anthology, and beyond. Check back here for updates on when these stories will be available. We will be busy at work over the next few months making this anthology the best we can – many people are donating their skills to ensure the quality of the finished anthology is impeccable. Here are the 55 accepted stories, laid out in their running order and ready for copy edits. 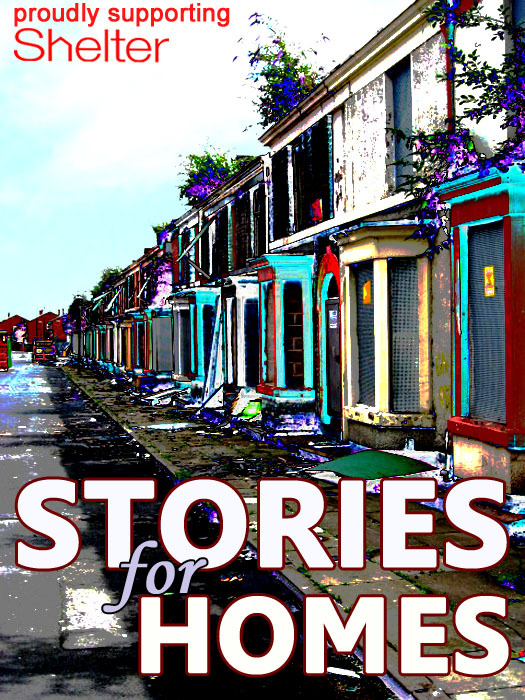 If you can’t wait to read them, don’t forget that Stories for Homes 1 is still available to buy in paperback and e-book here and all proceeds go to Shelter.